If you’ve been paying attention (and I hope you have! ;-)), you already know that I am a huge proponent of using a project plan to support personal and professional endeavors. It ensures that I remain organized, on time and on budget – especially on large-scale or multiple projects. I am currently in the initiation and execution phases, respectively, of two large-scale home renovation projects that will definitely require the use of, at least, project planning fundamentals. Instead of further prefacing this post with the merits of using a project plan, I will just jump into the topic of home renovation; and how, with a little planning, YOU should be able to stay on track, on time and on budget if you too are planning or executing your own ‘reno’. 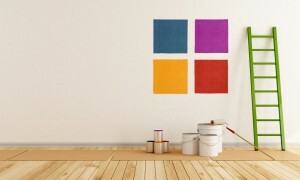 If you’re hoping to find out how to renovate your home, this would be the wrong blog! I am not an architect, carpenter, electrician, plumber, mason, or any other type of contractor. I happily relinquish most of the trade work, save for some demolition, light carpentry and drywall, installation of fixtures and painting, over to contractors. My personal contribution to a renovation project is primarily in the form of project planning, implementing and budgeting. From conception to initiation, launch and execution, performance and project close-out I strive to ensure that all goes well, start to finish. I get in on the demolition-action whenever possible. Side note: Want to work out some stress? Tear down a few walls. It’s really, oddly, fervidly satisfying! Demolishing walls, ripping up floors, removing doors and windows, smashing tile … just plugging away at it until I can’t lift a shovel or sledgehammer one … more … time truly is sweat equity; and I enjoy it a lot! When you are demolishing with friends and family you can get a lot of work done quickly; and it can be a lot of fun even though it’s hard, physical labor. My family members and friends gather, plan, demolish, rebuild various portions, and finish as much as possible together; and along the way we bring in the necessary contractors to finish that which we cannot, should not, do. Our individual experiences range from completing small projects (a bannister here, a closet there), to complete, full-scale, top-to-bottom renovations and ‘flips’ including design and installation of kitchens, bathrooms, flooring, landscaping etc. We are not new to this; but as mentioned, we are not contractors. We learn as we go; and we apply what we’ve learned along the way to each new project. There are a few hints in that previous paragraph about how one can avoid scope-creep and reduce expenses and the time it takes to complete a renovation project, big or small. Did you get them? I’ll come back to this, as it is the purpose of this particular post. But first, some context on our current projects: The first project is … sizeable; and it will certainly provide excellent fodder with which to blog and vlog over the next few months. I hope you stay with me as I share our experience throughout the various phases of this project as it is a complete interior design and rebuild of 2800 square feet! What was formerly three separate apartments under one roof across two floors (with 3 fireplaces, 3 kitchens, 3 bathrooms, 3 family rooms and a bunch of bedrooms) is soon going to be one home with 1 family room, 1 fireplace, 4-5 bedrooms, at least 3 bathrooms, a large open concept kitchen and dining room, a new interior staircase, large outdoor second-floor deck and outdoor fireplace and common area. If I have it my way, there will also be a small wine/tasting cellar. More on that later! We are, fondly, referring to this property as the ‘beach house’ as it sits upon nearly 300 feet of white sand private beach on Georgian Bay, Ontario. Below, Top Left: Half of main floor. This used to be a kitchen|bath|bedroom|laundry. We plan to open this up with a large kitchen + island, dining area, bath/laundry, bedroom + ensuite bath). Top Middle: Same as picture to the left, from other side of the structure. 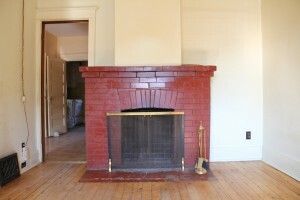 Top Right: Family room with fireplace. We plan to keep the fireplace, and among other things, update it with a gas insert; and a redesign of the window by raising and enlarging it to allow for a panoramic beachfront view. Bottom Left: Half of the second floor. 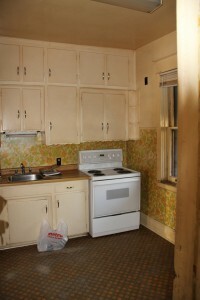 This was a kitchen and a couple of bedrooms + bath. We plan to build two bedrooms with ensuite bath’s here. Each will have panoramic views of the beach and Georgian Bay! Bottom Middle: This is the other half of the second floor. 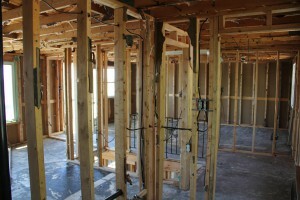 We plan to build two more bedrooms with ensuite baths. Each will have panoramic views of the bay as well. Bottom Right: The staircase. 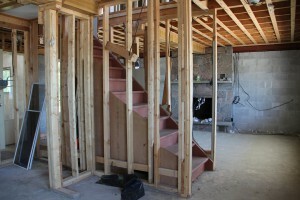 Oh … the poor, unfortunate staircase! We plan to, ehhem, reorganize, the placement to enlarge the family room. The second project is only slightly smaller in scope yet it will require many different types of contractors than that of the beach house and a different muscle-set for demolition, notwithstanding. This project involves the addition of approximately 450 square feet of living/dining space to the existing house as well as the addition of a garage, correction of foundation and elevation issues, and installation of no less than 8 windows and two doors. This is the ‘cottage’ property. And, b-r-e-a-a-a-t-h-e. Successfully completing these projects over the summer and early autumn simultaneously will take determination, focus, planning and a lot of what my father called ‘elbow-grease’! With any home renovation project there will always be cost, time and risk factors that one must consider and build into their plan. In the second paragraph I eluded to how projects, big or small, benefit from the inclusion of family and friends at the demolition phase. It can take many hours of hard work to demolish parts of a structure. YOU MUST KNOW how to do this safely. I do not recommend that you simply start tearing at walls! 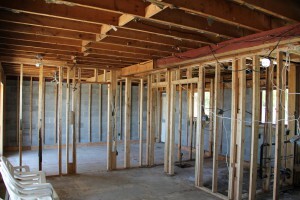 Get a consult on structural walls, beams and foundation, heating, wiring, plumbing. Involve a contractor to advise (or help) on how to SAFELY make changes. Do not do this alone. Remember to wear protective eye and footwear. Get gloves to protect your hands, dress appropriately, bring water and food! Do you have/need tools? Here’s an important tip that can be easily overlooked: Keep your work area clean! 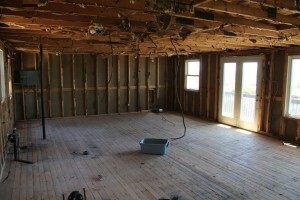 You will need trash bags, brooms and perhaps dust masks as well as someone designated to help keep the work area clean. You will want to reduce the amount of dust and dirt and eliminate danger completely from your work environment. The fireplace had to go! 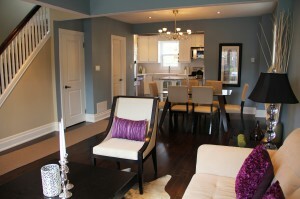 This was the living room in the house that we reno’d in 2012. The dining room is behind the fireplace, and the entrance to the kitchen can be seen to the left at the end of the hall. 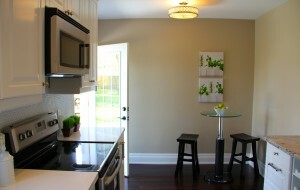 This is the living room, dining area and another view of the kitchen after the renovation. 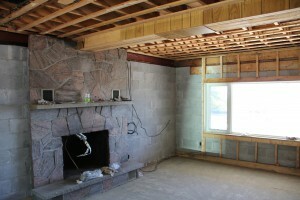 We opened it up by removing the fireplace and walls that separated the three rooms. Opening the kitchen up with a garden door added light and elegance. It’s much bigger, brighter & just better, no? 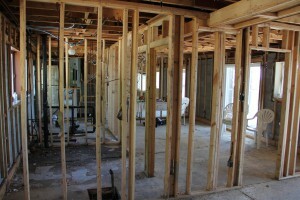 Taking care of demolishing will save you a lot of money and a lot of time if planned properly. The more people that help, the quicker you will finish. Keep in mind that you can also have too many people. You don’t want to have people getting in the way of your progress! Evaluate the work that needs to be done and plan accordingly. You will need to dispose of what you demolish. You may need to rent a bin/box; so be sure to include this in your plans and budget if so. The cost of renting a box will usually be dictated by the size of the box, how long you need it for, and how much it weighs once you’ve filled it. You may need more than one box. This will increase your cost. Negotiate costs with the service provider! Remember to pile your demolished material in the box in a way that allows you to get the most bang for your buck (insulation on the bottom, paneling piled flat, beams stacked, other materials placed in between to fill the gaps). The amount of money and time that one can save by demolishing with family and friends will be determined by the size of the project and what you’re demolishing. But, frankly speaking, saving any money that you can is your goal. Do not over-spend. Remember, this is sweat-equity; the ownership interest, or increase in value, that is created as a direct result of hard work by the owner(s) and/or those that will benefit from the build. If you can’t contribute much financial capital to the enterprise, you CAN invest yourself, your creativity, work-ethic, and time. The payoff, financially and otherwise, can be huge! Just remember that different people will be performing different functions. Stay organized and stay safe. More pictures and videos will be posted very soon! Stay close! A total of 8 people assisted with this phase of the project. It took one week to remove all walls, flooring (tiles and linoleum throughout), appliances, ceiling, insulation, bathrooms, kitchens. We stripped it back to the studs and blocks. 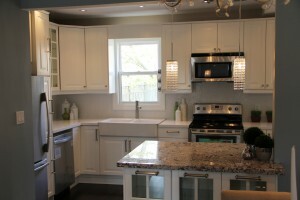 We estimate that we’ve saved $25,000.00! That’s a conservative estimate. Savings could actually be $30,000.00 – $40,000.00! A final reminder: Mortgage brokers save you time and money. With an experienced and knowledgeable broker, you don’t have to wade through complex choices and become an expert. We help YOU make the smartest decisions. If you or anyone you know is interested in obtaining, renewing or refinancing a current mortgage, reach out to us! We will get you the lowest possible rate and the product that best suits your needs. Roy, our Operations Manager spearheaded the creation and launch of our website and social media initiatives as well as the design and roll out of our new company logo and rebranding while leading our strategic marketing, advertising and analytics endeavors. In his personal time, he enjoys photography, recording music, concerts, and traveling. Sometimes he sleeps. Budget First Time Home Buyer floor plan Home renovation interior design licenced mortgage broker line of credit mortgage brokers mortgage broker Toronto mortgage broker woodbridge Mortgage for Self Employed mortgage product renewal renovation project Your Money Matters Inc.